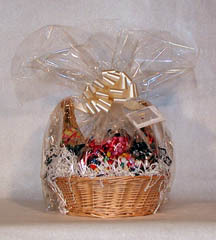 Gifts & Containers and other candies are available from jellybeans4u.com . Our price: $11.99  1 lb. 3 oz. This 6-section container holds up to 1 lb. 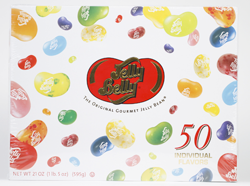 3 oz of Jelly Belly Jelly Beans, or any other of the wonderful candies that we offer. If you have a specific flavor or candy that you would like this container filled with, please email us when you place your order. Please be aware that the price will vary if candy other than Jelly Beans is requested. Our price: $57.99  7 lbs. 6 oz. This large 6-sectioned container holds up to 7 lbs. 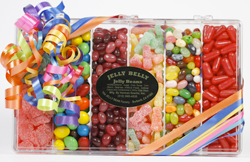 6 oz of Jelly Belly Jelly Beans, M&M's, and Locorice Pastels, or any other of the wonderful candies that we offer. If you have a specific flavor or candy that you would like this container filled with, please email us when you place your order. Please be aware that the price will vary if candy other than the above mentioned is requested. If an item is out of stock, a similar item of equal value will be substituted. here for a picture of whats inside! Our price: $19.99  1 lb. 3 oz. 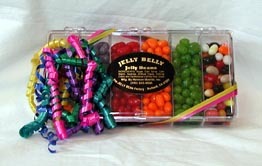 Fill this champange bottle with your favorite flavors of Jelly Belly Jelly Beans. You can inform us with your special request by email when you place your order, otherwise we'll fill it with assorted flavors. Our price: $9.50  10 oz. 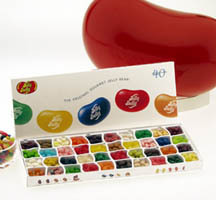 Here�s one of our most popular gift items, the 40-Flavor Gift Box. Your very own, self-contained candy shop where you and your friends can sample all 40 original, true-to-life Jelly Belly flavors. No more guessing which flavor you�re savoring - each flavor is nestled in its own little compartment and identified with a flavor map. Dig in and enjoy! Our price: $20.00  21 oz. Lovely golden script of flavor names is the background for the box top and decorates the parchment liner inside. Individual pockets hold each flavor, and a guide helps identify each one. 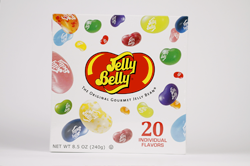 Also inside is a Jelly Belly Menu with recipes for combining flavors. This fun little container holds 1 lb. 13 oz. 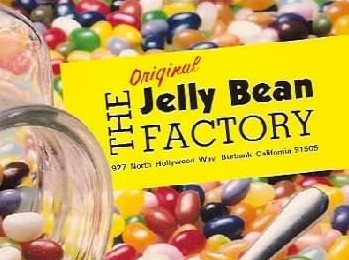 of your favorite Jelly Belly Jelly Beans. We will fill this Scoop and Serve with your choice of flavors or with an assorted mix. Email us with your flavor list. 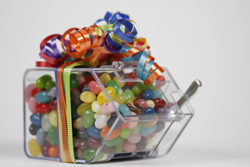 This fun little container holds 1 lb of your favorite Jelly Belly Jelly Beans. We will fill this Scoop and Serve with your choice of flavors or with an assorted mix. Email us with your flavor list.